Some days I feel like the soldiers manning the DMZ between say, North and South Korea. Perhaps there’s a better set of combatants to exemplify this zone I’ve entered between Copper and Puck. Copper is our 11 year old orange Tabby; and Puck is our almost-one year old (almost 7 year old) black Oriental Cross. Call it life in a furball war zone. The kitten seems to want much more contact than the old man. He wants to jump and play almost all the time. Sometimes my heart aches for him as it would for a little boy whose older siblings think he’s a pest. I’ve seen Puck gently push one toy after another in front of the old guy as if to say, “Want to play with me?” When the first toy goes unnoticed, he’ll try a second, “How about with this one?” Zero engagement. Copper’s refusal to play shower curtain tag or hide and seek, his utter disinterest in toys, is the lesser of my worries. Like any good parent, I’ll fill in as a playmate for Puck with enthusiasm. First with one toy, then a game. He’s delighted to have a someone to play with him. He fetches the crunchy ball, retrieves it gently from my mouth. He chases the long neon green boa as long as I’m willing to flail it around. It’s the dominance gaining behaviors I’m worried about. I can’t tell if I’m projecting but it seems like he’s finding myriad ways to demonstrate to the old guy that he’s the boss. The favorite arm of the sofa where Copper used to perch now clearly belongs to Puck. The mealtime ritual is annoying or a hoot depending on what kind of a day I’ve had. We learned quickly that Puck would eat all Copper’s food first, then finish his own. Intervention was clearly in order. We tried standing over them while they ate, but the old guy likes to just nibble a little, then come back. Nibble a little more later. Except there was never any more left. He can’t be persuaded to speed up his feeding habits nor can Puck be persuaded to slow down or share. So the dishes were separated. Not an easy thing in a loft. Thank god there’s a door on the bathroom or we’d have to be feeding someone in a closet. Now the dishes are separated and we wait to “release the hound” or “lower the shark” until after Copper has nibbled a couple of times before giving up interest. Puck flies out to his “brother’s” dish to see if possibly we’ve forgotten to stow it in the cabinet for Copper’s later nibbling pleasure. The last place Copper seems to refuse to give up is his sleeping spot next to me at night. Puck has conceded that he gets the end of the bed between Caleb and I and Copper gets up high next to me. I’m a little worried that Puck’s latest trick is to tunnel under the covers (we like to sleep with windows open) and he’s just figured out how to do that and insinuate himself under them between me and Copper. I see Puck chase the old man, who goes hissing and complaining but goes, into the closet where he’s got a safe little place he likes to sleep. I finally put down a fleece blanket for him so he has a comfy spot. I just hate for him to be exiled in his own home if he doesn’t actually want to be in there. I’ve begun to coax or drag him out by showing him a new spot just for him and trying to protect him from attack there. The kitten is learning self-control, but it’s not natural yet. I see him or feel him slinking behind me as I work, crouching in pouncing mode toward the napping old guy…I give him the verbal “Nooooo, be a good boy….” and he returns to His arm of the sofa. The minute I get up to refresh my coffee, things change. Most Moms develop eyes in the back of their head. I’m no different. I turn my head just in time to see the kitten low and stealthy heading back to Copper’s new perch. “P u c k….nooooo”. You can feel his frustration as he forces himself to double back to the sofa. I wonder constantly if I’m projecting things onto the cats that don’t exist in their world. Is Copper conceding to the natural order of the kitties evolution? Maybe a younger larger cat is supposed to assume dominance or is at least allowed to without ill will or hurt feelings? 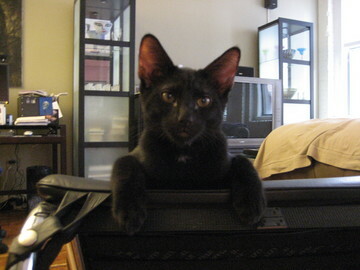 Or, maybe Copper who was the only cat for almost five years, is wondering why I brought a tormentor into his life? 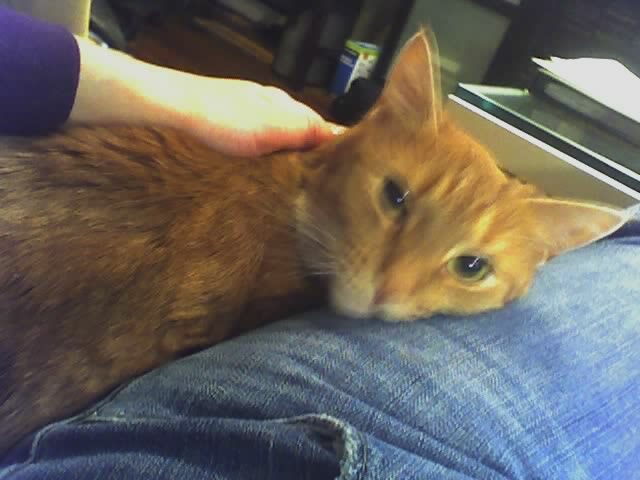 When I picked Copper up at the shelter he was 6 and was perfectly friendly with all the other cats in his house there. I’ve seen him back down dogs twice his size and befriend others just as large. He’s usually in the midst of my parties whether there’s four or forty guests. I followed all the best advice about introducing the new cat into the house, bringing both to neutral territory, keeping the kitten cloistered in the bathroom the first few days, etc. And so, I worry. I do everything with one eye on the kitten and an awareness of the older cat’s whereabouts. I listen for the tumbling bodies, hissing complaints. I play with the kitten when I can. And sometimes, we all snuggle together on the sofa or in the bed. Often, Copper shares his closet spot with Puck and I hope that Puck will mellow out and Copper will remember the joy of play. One thing’s for sure, when Copper leaves this mortal coil Puck is getting a kitten for a playmate/tormentor. It’s only fair.